On June 23, 2018, about 1440 eastern daylight time, a Cessna 182, N5682B, struck three vehicles following a complete loss of engine power and subsequent forced landing to a residential area about one mile east of Herlong Recreational Airport (HEG), Jacksonville, Florida. The commercial pilot was not injured. The airplane received substantial damage to the right elevator and the right wing. The airplane was registered to Jumpstart Skydiving LLC and operated by the pilot as a title 14 Code of Federal Regulations Part 91 skydiving flight. Visual meteorological conditions were reported in the area about the time of the accident and no flight plan was filed. The local flight originated from HEG at 1400. The pilot reported that after delivering four skydivers, he returned to the airport. On final approach, at about 1 mile from HEG at 2,500 ft above ground level (agl), the engine lost power. 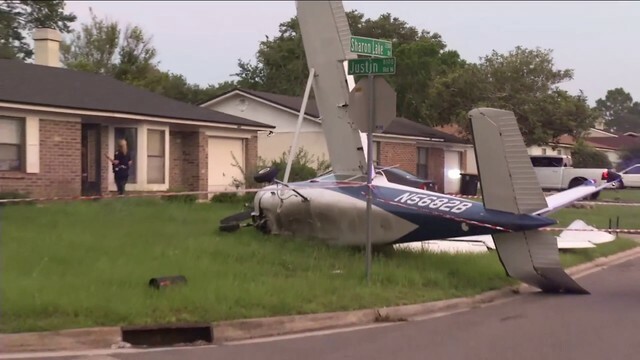 He realized he did not have sufficient altitude to clear a stand of trees and landed on a road in a residential area. Upon landing, the airplane struck three vehicles then came to rest on its right side. 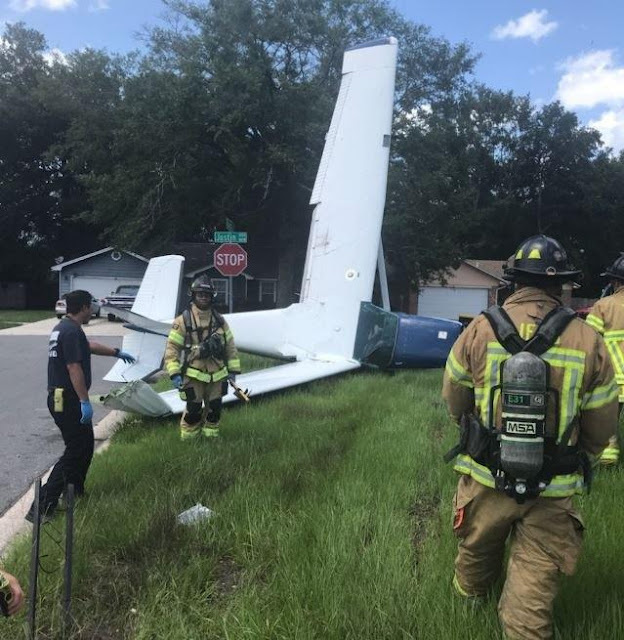 The pilot stated he did not know of any mechanical issues that may have precipitated this accident. On the day of the accident the pilot received the airplane with about 22-24 gallons of fuel on board according to his fuel quantity check, which he accomplished using a dip stick. He then flew three local flights, one up to 10,000 ft msl, the second up to 11,500 ft msl, and the third up to 10,000 ft msl. He refueled and put 18 gallons of fuel in the airplane, but did not check the total fuel quantity with the dipstick. He then flew three more local flights, the first up to 11,500 ft msl, the second up to 10,000 ft msl, and the third up to 11,500 ft msl. He made a second fuel stop and put in 14 gallons of fuel, but again, did not check the total fuel quantity with the dip stick. He then made two more local flights, the first up to 10,000 ft msl, and the second and accident flight up to 11,500 ft msl. The pilot flew a total of eight local flights, four up to 11,500 feet msl, and four up to 10,000 ft msl. The total flight time amounted to four hours. The pilot did not perform a fuel consumption check during any of the eight flights. He stated that to prevent shock cooling the engine, he would descend with power applied, not at idle. He also stated that on the accident leg, he gave way to an airplane that was also landing at HEG. The airplane was manufactured in 1956 and underwent several modifications to date. The original Continental O-470-L engine was replaced with a Continental IO-470. This normally fuel injected engine was modified to use a carburetor, in accordance with supplemental type certificate number: SA00562NY. The airplane was further modified to include Monarch fuel tanks, speed brakes, shoulder harness and wing extensions. After the modifications, the wings had 12.4 additional square feet of surface area. The maximum gross weight was increased from 2,550 to 2,950 pounds and the empty weight was reported as 1,592 pounds. The Meteorological Aerodrome Report for HEG, located about one mile east of the accident site, about the time of the accident reported an outside air temperature of 33°, which is 18° higher than the standard temperature of 15° C for sea level. The dew point was reported as 22°C. These values were plotted on a carburetor icing chart and placed the carburetor icing probability at light, during cruise and descent. Herlong Recreational Airport (HEG) is an uncontrolled, public airport located 8 miles south-west of Jacksonville, Florida. It is at 85.9 ft above sea level and has four runways, 7/25 and 11/29. The pilot was attempting to land on runway 29 when the accident occurred. Fuel from the airplane was unavailable for testing. On the day of the accident, at the accident site, a representative from the FAA flight standards district office checked for fuel in the fuel tanks and found none, however, the airplane had come to rest on its right side with the right-wing tank breached and the left-wing tank in a position to allow drainage through the fuel supply into the breached right-wing tank. Additionally, the pilot stated in the past he had seen fuel coming out of an area around the vent and inside of the strut while he was in a left-hand turn. On August 8, 2018, the engine was tested at the recovery facility. The engine ran successfully, and the magneto's tested within the acceptable standards.